The seeds for 99 MW of new wind power in Minnesota were planted by local farmers and were brought into reality by experienced wind developer Iberdrola Renewables. 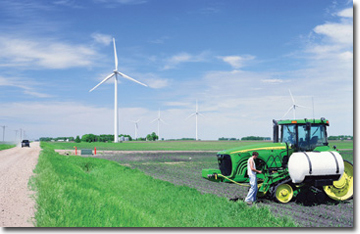 The 99 MW Elm Creek wind power project, like its predecessor the 100 MW Trimont project, was initiated by a group of Minnesota farmers. The recently released Wind Technologies Market Report from the U.S. Department of Energy underlines that a handful of U.S. states are leading the nation in the generation of wind power-and Minnesota continues to be among the top five. By the end of 2008, according to the DOE report, Minnesota was number four in the U.S., with some 1,753 MW of wind power generation. That represented 10.4 percent of the state's power generation coming from wind, placing Minnesota only behind Iowa in terms of the percentage of its power delivered by wind. The state appears to be well along the path to achieving its goal of generating 25 percent of its energy from renewable resources by the year 2025. While the report notes the aggressive expansion of wind power in the U.S. has been slowed by the general economic downturn-and the crisis that hit financial markets-2009 will still be a year of significant growth. Part of that growth will continue to come from Minnesota. Iberdrola Renewables' recently completed 99 MW Elm Creek project, located near Trimont, Minnesota, will be a significant contributor to the state's wind power numbers. Iberdrola Renewables itself, of course, has been a key part of the international growth of wind power. The company is said to be the world's leading provider of wind power, with almost 10,000 MW in operation globally-more than 3,000 MW of that in the U.S.
Iberdrola Renewables' involvement in Minnesota came through the 2007 acquisition of PPM Energy. The Elm Creek project is really the follow-up of a previous wind project, the 100 MW Trimont project, which was completed in 2005. "Trimont was kind of unique," explains Tim Seck, director of development for Iberdrola Renewables. "There was a group of landowners who saw the potential for wind power in the area where they were farming. The group organized itself and asked neighbors if they would like to be part of a wind project-and the overwhelming answer was 'yes'." The group knew there was a Request for Proposals (RFP) for wind power pending from Minnesota utility Great River Energy, and they went to work preparing their own RFP. Seck was working at Great River Energy at the time. "We received the RFP from the group of landowners, and it was a breath of fresh air," he recalls. "It was a high quality response with a competitive price. It was a compelling story-here was a project that was entirely conceived by a group of landowners who wanted to host a wind project. And-as is the tradition in Minnesota-they wanted to do it in a cooperative-type fashion." All of the landowners were customers of one of Great River Energy's power distributors. Since Great River Energy itself is a power cooperative, the project was being proposed by the members of one of the utility's own member/distributors. The Elm Creek project has followed that model. "Elm Creek, like the Trimont wind farm before it, was born in the minds of local farmers," Seck said. But the group realized it would need some help, with both the Trimont and Elm Creek projects. "When we won a Power Purchase Agreement from Great River Energy for the Trimont project, we knew we would not be able to secure turbines or build a project. So we said 'let's bring in the professionals,'" said Neal VonOhlen, who is chief manager of the landowner groups for both Trimont and Elm Creek. With the large scale of the Elm Creek project, Iberdrola Renewables tightly monitored activity on the turbine construction sites, to regard the needs of local farmers and keep to the construction schedule. After a search of wind power companies, the landowners selected Iberdrola Renewables, then known as PPM Energy, to build and operate the Trimont project. While the landowners wanted to receive revenue from the projects, they did not want to own them. "They wanted to receive a revenue stream above and beyond the traditional land payment, and Iberdrola Renewables was amenable to that," explains Seck. "They liked the idea of getting money-starting on day one-and also liked the idea of being shielded from the risk of ownership." Understandably, the landowners, being farmers, felt they dealt with enough risk with their own businesses. The Trimont wind project was such a success that the group figured, why not replicate it. "The Trimont model worked so well, everybody wanted to do it again," says VonOhlen. 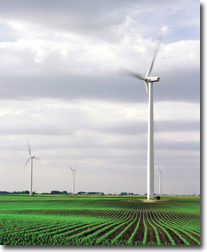 Adjacent landowners saw their neighbors prospering and were very interested in being part of another wind project. The second landowners' group offered every landowner in the Elm Creek footprint the opportunity to participate in the project. If they did participate, they had the opportunity to share in a percentage of revenue generated by the project. If they did not participate, they could simply receive the traditional acreage and turbine payments. Some 56 landowners ended up participating in the Elm Creek project, which covers an area of 9,554 acres. The kind of landowner participation seen with Elm Creek and Trimont is ideal for a developer, says Seck. "These are our easiest and best projects to develop-the landowners themselves are involved in the project, and as a group, they work through who is invested. And they are great eyes and ears for us in the community." Seck noted that whenever Iberdrola Renewables did presentations at permit meetings at the local, county, and state levels, they were always accompanied by representatives from the landowners, reinforcing the local support the projects have. "They are a great ally for us," he says. "It's been a fantastic relationship for us, and I think for them too. We've delivered a high quality project that they can be proud of, and they are well compensated." Seck relates a story that illustrates the tremendous buy-in the Elm Creek project had from local landowners and local people: The state had scheduled an information meeting on the site permit and had brought coffee for 75 people. "Typically, the turnouts for these meetings are large, with most people there just out of interest in the projects, with others expressing concerns and asking hard questions." Instead of the 75, only a handful of people turned out. And because they already knew a lot about the project, there were really no questions. "The only question we got at the meeting was, 'why aren't you building it six months sooner?' That's not a tough question to get." While they have been successful, Seck notes that both Trimont and the Elm Creek projects marked a departure from the standard business model that Iberdrola Renewables usually follows. "As a company, we work hard to earn the trust and respect of the community where we are doing business, and that involves looking at how people in an area approach doing business. And if you are working in Minnesota, cooperatives (or farmer-owned LLCs) are often how people get things done. You have to understand that and be willing and able to adapt to that. "From Iberdrola Renewables' perspective, it was a matter of this is the business model in this particular part of the country. Let's run the numbers like we would on any other project that comes to us, and if the numbers work, we're good with this." The Trimont and Elm Creek sites share similar wind characteristics. Being farm country in Minnesota, "it's pretty darn flat," says Seck. "This is corn and soybean country." The two projects actually share a common boundary, with the closest turbines of the respective projects being about 1.5 miles apart. There was a well-established county road system in place, and Iberdrola Renewables set up its access roads from these roads. The company typically builds its wind power projects around the summer months, so it was able to avoid the severe winters for which Minnesota is famous. With both projects, they wrapped up a lot of the construction work by Thanksgiving. "By then, we've done the bulk of the construction work, and it's more commissioning work in the colder months," explains Seck. M. A. Mortenson did the road and foundation construction, installation of the 66 GE 1.5 MW turbines, and the operations and maintenance building upgrade. The company was basically operating in its backyard, since it's based in Minneapolis. Mortenson has done a lot of projects for Iberdrola Renewables, notes Seck. "We have a great relationship with Mortenson, and we were very happy with the work they did for us on Trimont and Elm Creek." Par Electric did the underground and overhead collection system installation and substation expansion.Sioux Falls Tower/GEC did the met tower installation. In terms of the planning and logistics of the construction project itself, Seck explained that there were daily progress reports before crews deployed each morning, as well as higher level meetings on a weekly, if not more frequent basis, depending on what stage the project was at. And there were side meetings to tackle specific aspects of the project. "If they were about to start work on the substation, there would be a special meeting." Internally, Iberdrola Renewables had weekly construction reports that showed what stage they were at erecting the turbines and what percentage of the project was completed. With the large scale of both the Trimont and Elm Creek projects, activity on the sites was tightly monitored, both to keep to the construction schedule, and to be mindful of the landowners. "We want to make sure we are courteous of the landowners' needs," Seck says. "Because we are carrying out construction in the summer, we are building when they are farming. We have to be very attentive to anything that could be potentially damaging to crops. We're guests on their property when we are working there." And well before a single shovel or bulldozer blade hits the dirt, the company is very involved with the landowners on locating the turbines. "The landowners would look at every stake in the ground and the proposed roads, and they would provide some very good insight-they know the land and how it is farmed. I think we were able to come up with an even better layout because we had more landowner perspective," said Seck. Since the land is already developed for crop farming, there was little in the way of environmental considerations for Trimont and Elm Creek. "The comments from the regulatory people tended to be along the lines of 'if you could pick a part of Minnesota that we would like to see developed, you picked the right one.'" Among the most attractive aspects of the Elm Creek and Trimont projects are their locations and the links they offer to the grid. Great River Energy has a 550 MW natural gas-fired peaking operation, Lakefield Junction Station, near the town of Trimont. "Our projects were able to connect with Lakefield's transmission system right next to the plant," says Seck. Since Lakefield is a peaking plant, it operates in the range of three to seven percent of the time, on an annual basis. It's a good match of baseline and intermittent power between Lakefield and the Elm Creek and Trimont projects. When the wind is blowing, it's unlikely Great River will have to call on the power from Lakefield. When the wind is not blowing on hot summer days, and there is a need for extra power, Lakefield can be fired up. Seck said Iberdrola Renewables was fortunate in that it got in the queue for interconnection approvals early for both Trimont and Elm Creek, allowing the projects to move ahead in a fairly speedy fashion. And what is now two wind projects is expected to become three projects; Iberdrola Renewables is hoping that construction can start in 2010 on the 150 MW Elm Creek II. Having three projects in a small area will underline the benefits to "clustering" wind farm projects, says Seck. All three projects will share a substation, and the power from all three will eventually be going on the line running from Lakefield. Seck says the company seeks to cluster plants, wherever possible, and there are definite benefits. An example: Iberdrola Renewables' wind projects along the Columbia River in Oregon and Washington can easily share resources-people and parts. "We can share talent back and forth," he says. "And it can make it much easier to train wind technicians. We can send them to a wind facility that has similar characteristics and get them trained before a new facility opens." Along a portion of the Columbia River that forms the border between Washington and Oregon, the company has a regional parts warehouse for their wind projects and is considering locating a similar facility in the Midwest. With the addition of the first Elm Creek project, Great River Energy already has 315 MW of wind capacity under contract, the most of any power cooperative in the U.S.